We live in a time (the last couple of years) that has brought forth some of the most outstanding coming-of-age tales I've encountered (in print and on the screen). I have most recently fallen in love with 2012's The Perks of Being a Wallflower and last year's The Spectacular Now, which will be the running for my favorite of the decade and one of my all-times. In the world of YA Lit, John Green is spinning witty, sometimes heartbreaking, stories of the pain of growing up with titles like The Fault in Our Stars. I just a few minutes ago, in fact, put down his latest novel-to-be-adapted for the screen, Paper Towns, which tells a story that is just my kind of Bildungsroman. A boy creates the image of a perfect girl in his mind only to learn, to grow enough, to find out that perfection doesn't exist. We get to know people in our minds, and then we are forced to know them for real. Those two things are vastly different. My Thursday Movie Picks this week hold this notion at their centers. They are about idealistic young men, who learn truths about life and love (among other things) that transform them, plain and simple. 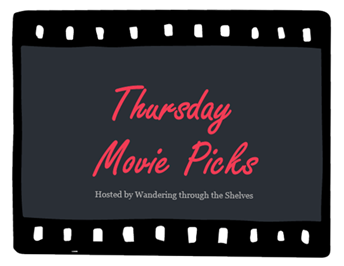 For this week's entry in Wandering Through the Shelves' Thursday Movie Picks series, I have selected a trio of films that totally reveal my age. I was in my mid-teens when the following movies came out, and all three (vastly different in story and style) punched me right in the gut, then filled my heart with pure love and affection. These are films that are not only about characters coming-of-age but also about my own coming-of-age as a lover of movies and long-time sucker for "That Obscure Object," the beautiful and unattainable. After seeing some trailers and TV ads for an odd-looking comedy with Bill Murray called Rushmore, I had no idea what I was getting into. Thus began my initiation into the world of America's purest auteur, Wes Anderson. Rushmore is the story of a boy and his school, a stuffy, private school filled with boys of privilege. Our hero, and founder or president of most of the school's extracurricular programs, Max Fischer (Jason Schwartzman) is failing most of his classes. He is on the verge of expulsion. At chapel one morning, he is introduced to local businessman (and father of twin Rushmore Academy jocks), Herman Blume (Bill Murray). Soon after, he becomes infatuated with a new Kindergarten teacher named Rosemary Cross (Olivia Williams). An odd love-triangle ensues to the tune of deep soundtrack cuts from the sixties and seventies along with Anderson's tightly planned and controlled, perfectly framed imagery. This marks the first time Anderson's style becomes evident. It also marks Anderson as a born storyteller, a man who understands the pain of youth. When Max comes to the realization that his first great loves, woman and school, are but fleeting stops on his path in life, we, as viewers, are rewarded right alongside him, complete with Cat Stevens' "The Wind" on the soundtrack. Adapted from the first novel by Jeffrey Eugenides (a man I consider a soulmate), Sophia Coppola's gorgeous first feature seems at first to be a story about sheltered teenage sisters in 1970s suburbia. Alas, by the end, that isn't the case at all. This is a coming-of-age story, not about these girls at the center, but about the boys across the street, and down the road, and at the private Catholic school they all attend. Narrated by an unnamed member of the neighborhood boys (Giovanni Ribisi), Eugenides' straightforward, yet complex, prose comes alive on the screen. As the five sisters, each a year a part ranging from 13-17 and led by sexpot, Lux (Kirsten Dunst, the object of all my adolescent fantasies), deal with a family-breaking tragedy early in the film, the boys are left to figure it all out. Who were these girls? What was it about them? Why did we love them so much? The Virgin Suicides cuts straight into the psyche of the sensitive teenage boy. I watched this movie the first time at 16. It hasn't left my mind or my gut since, now 14 years later. Cameron Crowe's autobiographical love letter to youth, journalism, and rock 'n' roll is one of the true loves of my movie life. It is warm and touching and beautifully written and directed, and the 70s rock soundtrack is one of the finest ever assembled. 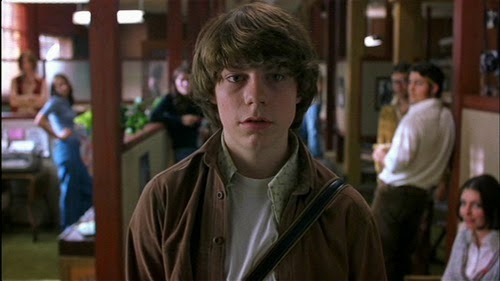 The lead performance from then unknown Patrick Fugit is perfect. He plays William Miller, a 15-year-old kid from Southern California, who gets the opportunity of a lifetime when he meets Creem Magazine's resident rock critic, Lester Bangs (played brilliantly by the late great Philip Seymour Hoffman), and ends up with a gig for Rolling Stone, covering an up-and-coming band called Stillwater, led by the elusive guitarist, Russell Hammond (Billy Crudup). Kate Hudson arrived like a storm and won an Oscar nomination as "band-aid" and William's love interest, Penny Lane. This movie sounds great, looks great, makes you feel great, and is one of the defining coming-of-age stories of my generation. The Virgin Suicides! Great movie, great book...the beginnings of my love affair with Sophia Coppola! Nice picks. I kind of hate Rushmore, but I understand the appeal. Almost Famous is a really solid film as well. Thanks man. The Virgin Suicides seriously changed my life. I still feel it. It one of the few perfect movies. And I love all things Wes Anderson, especially Rushmore, which I saw before I knew anything about Wed Anderson. I can't help it. He got to me first, as in just at the time I was beginning to understand directorial style. He will never fail for me. I even love The Life Aquatic, which most people really hate. Also, Jeffrey Eugenides' other two novels are as good if not better. Have you read them? I identify with his work more than any other author I've read. I've had Middlesex on my must read list since it was released...but never got around to it. I really need to read that...maybe this year! Middlesex is epic, man. And genius. Follows three generations of a family of Greek immigrants in Detroit throughout the 20th Century. His latest novel, The Marriage Plot, chronicles that time right after college graduation. It spoke to me. I liked Rushmore, though it was the one I had difficulty watching because I am not the biggest fan of Jason Schwartzman. There was something about him that initially annoyed me. I hear ya. I'd say he is annoying to some. I've never had a problem with Schwartzman. I find him hilarious. He is especially good in the cancelled HBO series, Bored to Death. Nice list! I loved The Virgin Suicides and Almost Famous! Great films. These are very you! I would have to include something ultra cheesy for me, like 10 Things I Hate About You. That wouldn't be a bad pick. Haven't read Paper Towns yet but will soon especially since the movie is coming out. Love love The Virgin Suicides. The book and the movie. Excluding Mary's end, the movie is possibly one of the best loyal adaptation. Paper Towns is a cool story. Green writes smart teen characters. I wish the movie adaptation of TFIOS had hit me a little harder. It lost its power when it should've been most powerful. But the Paper Towns movie should be good. More of a romantic comedy. The Virgin Suicides has been one of my favorites since I first saw it. Great movie!